Following an arrest a person will remain in jail until they are taken before a judge and arraigned. The general purpose of this process is to advise the defendant of the charges that have been filed against them and to set a bail amount for your particular case. The amount of your bail and the how you will be allowed to make bail will depend on the local and state laws where you were arrested and your own criminal record. 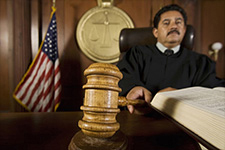 There are three main ways to be released on bail in the United States. The first type of bond is generally only allotted to first time offenders who have been arrested for nonviolent crimes. It is called a personal recognizance bond and it means that the court will release the defendant on their word that they will appear in court and not commit any crimes while out on bond. This bond usually carries no fee for the defendant, making it the most ideal way to get out of jail, if it is allowed in your jurisdiction. The second way to get out of jail on bail is to pay the full cash amount, called a cash bond. This means that you put up all of the money for your bond, which can be in the tens or even hundreds of thousands of dollars. Generally, once the case is resolved the person who put up the money will get it back, minus a small administration fee. The most common way to get a person out of jail on bond is called a surety bond, more commonly referred to simply as a bail bond. This is a bond in which a third party agrees to assume responsibility for the defendant appearing in court. However, a fee that is usually about 10 percent of the total bail amount must be paid first. The surety will pledge to the court that should the defendant not show up that they will pay the full bail amount. Surety bonds, outside of PR bonds, are the easiest, fastest and have the least up front cost, when it comes to getting a loved one released on bail. If you are in need of a surety bond in Kelseyville or throughout Northern California you will want to contact the team at Rob Brown Bail Bonds. We offer 24/7 bail bond service in Lake County, Mendocino County, Yuba County and beyond. Give us a call day or night at (707) 587-4563 to post bail in California today.